You are here: Home>Archive>Taylor Brown Collection.>Marriages.>Receipt for furniture. 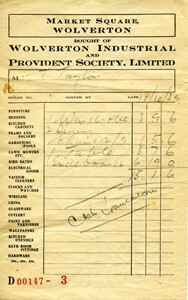 Receipt from the Wolverton Industrial and Provident Society Limited to Mr. T. Taylor. The receipt is dated 10.10.39 and is for a wardrobe, dining chairs, a table and a sideboard. The total amount is for £15.1.6 and is signed as a ‘Cash Transaction’. Item: Certificate of Marriage between Thomas Taylor and Louisa Ann Chown. Item: Certificate presented to Louisa Chown on her marriage. Item: Wedding invitation for the marriage of Frank Brown and Beryl Taylor. Item: Receipt for Beryl Taylor's wedding gown. Item: Marriage licence for Frank H. Brown and Beryl L. Taylor. Item: Certificate of Marriage between Frank Brown and Beryl Taylor. Item: GPO Greetings Telegram to Mr. and Mrs. Brown. Item: GPO Greetings Telegram from Walcot to Mr. and Mrs. Brown. Item: Receipt for household goods. Item: Frank Brown and Beryl Taylor on their wedding day. Item: Frank Brown and Beryl Taylor on their wedding day with family. Item: Official wedding photograph of Frank Brown and Beryl Taylor in a studio. Item: Official wedding photograph of Beryl Taylor in a studio. Item: Mr. and Mrs. Brown on their golden wedding anniversary. Item: Telegram from the Queen. Item: Wedding photograph of Jean Goodman. Item: Wedding invitation for Maisie Agnes Brown. Item: Walter Eric Brown and Muriel Churcher on their wedding day. Item: Letter from Betty Colquhoun. Item: Frank Brown and Blanche Wildman's wedding. Item: Walter and Lillian Brown.